Are you struggling to manage your iTunes media files, or you don't know how to manage them properly? Certainly, if you are having an unorganized folder, you must be aware of the difficulties that you encounter while searching and accessing your favorite files, like songs you imported from the CDs, purchased items from the iTunes store, such as music videos, songs, and movies, or other added items when you turned "Copy files to iTunes Media folder when adding to library" as ON in iTunes Preferences. Please enter Preferences to start the process. Once you enter the Preferences section, click on the Advanced tab. 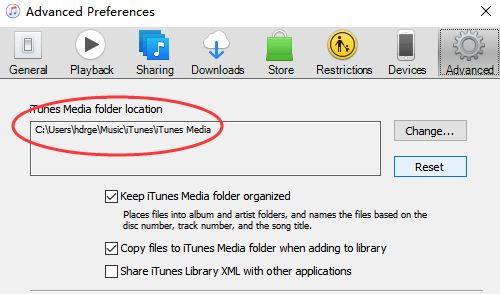 Once you click it, you will see a grey box under "iTunes Media folder location". To proceed towards location change, click Change button followed by entering the new changed location. Note: Once you change the location setting for your folder, file consolidation is required to move the files to the new location. To do so, choose File > Library > Consolidate files from the top menu bar of the iTunes window and click OK. Follow the easy step to keep your media folder totally organized. Go to the Preferences > Advanced tab (steps mentioned above). 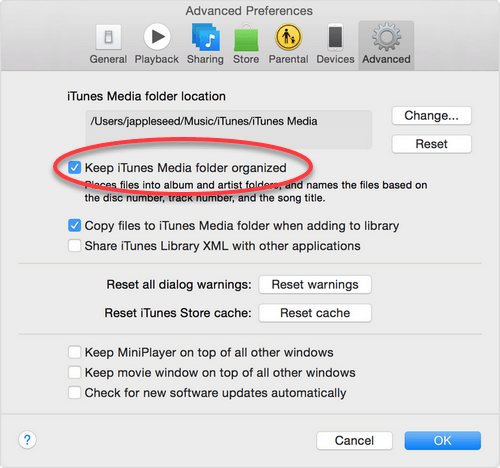 Select "Keep iTunes Media folder organized" to keep your files organized into folders based on information, such as album and artist and to name them basis the track number, disc number or song title. Go to the Advanced tab and click "Copy files to iTunes Media folder when adding to library" to store all your available media files directly. Not only it will put all your files in one folder, but also make it easier to backup or transfer the media. Further. 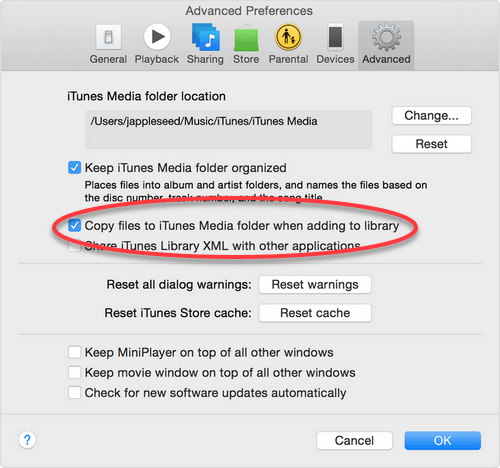 CD media imports get automatically added to the media folder while if you add media choosing "Add to library" option or by dragging MP3 files into iTunes. 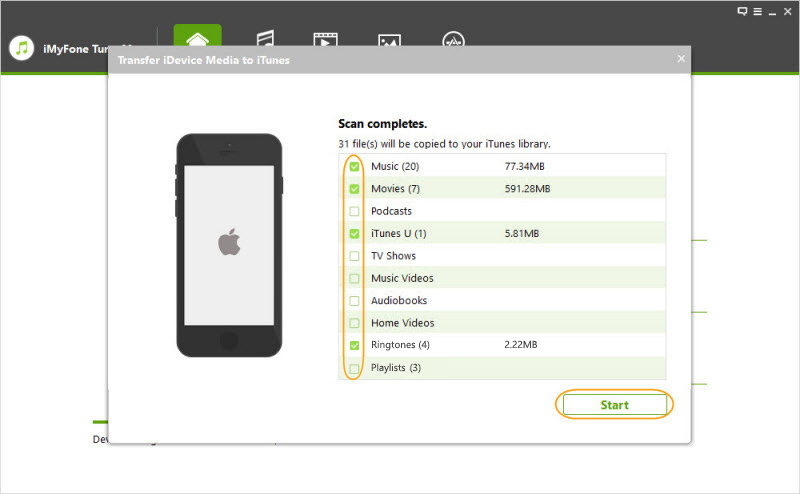 iMyFone TunesMate brings to you the easiest option available to effectively manage the iTunes media library. Think about, what it would be like when you can manage all your favorite files just with a click of a mouse, that too without even losing a single file! Yes, it's possible. iMyFone TunesMate transforms all your iTunes difficulties into super easy delightful steps. Don't worry, it’s no complicated thing, but a super friendly application with ultimate user-interface that takes away all your fears of data deletion and effective management of iTunes media files. 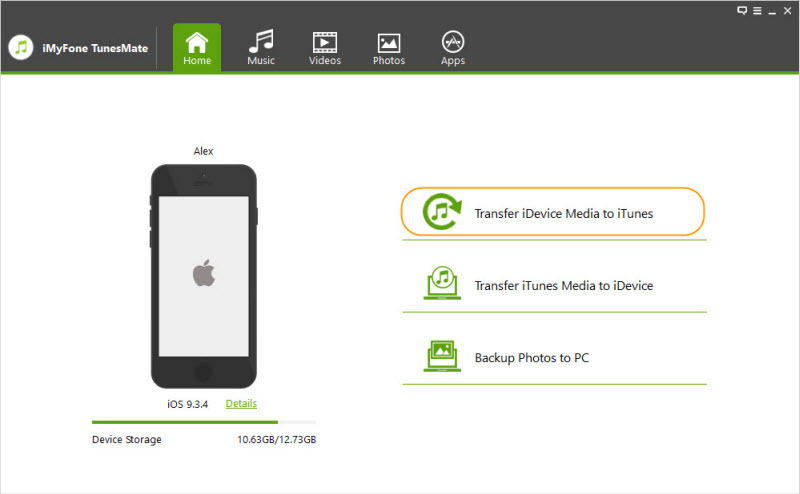 Effortlessly transfer your media files from both iPhone to PC/iTunes and PC/iTunes to iPhone. Experience no limits to export any kind of media playlists, movies, audiobooks, camera roll, music videos, music, iTunes U, home video etc. Bypass all restrictions of the iTunes and access your files your way. Using TunesMate is extremely easy. With just a few steps, you can proficiently organize all your files. Launch TunesMate on your computer and with the help of a USB cable, connect your iPad/iPod/iPhone. Choose "Transfer iDevice Media to iTunes"
After Step 1, you will see a list of all media files available on your device that are not there in iTunes library. All files in the list will be automatically checked by default. Proceed to transfer and if you wish to uncheck any of the files, do that. Click the Start button in the pop-up window. Just in a few minutes, the transfer process is done. Click on the Complete button to finish. How to Transfer iTunes Library without a Hassle? How to Access iTunes Library?